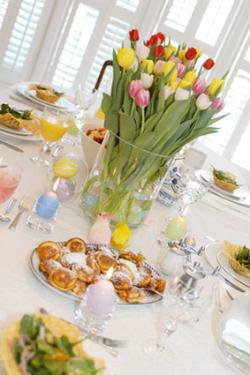 Whether you're religious or not, Easter is often a time for parties, family gatherings and large meals, especially brunch. Plan your menu in advance for for your special get-together with family and friends. There are many people on restricted diets because of doctors orders or by choice. Try designing a menu for those who want to celebrate without worrying about breaking their diets. You could offer a few higher-calorie items too, but serve them in smaller portions to help control the amount of calories and fat grams guests consume. Fruit salad - Choose a variety of different fruits to create a tasty fruit salad. Strawberries, cantaloupe, grapes, and honeydew melon make nice additions to any fruit cocktail recipe. Vegetable tray - Crispy, fresh cut vegetables are a nice addition to an Easter brunch. Carrot and celery sticks, cauliflower, broccoli, and small tomatoes all make for a good tray. Put a small bowl of classic spinach dip in the center of the tray made with low-fat ingredients and consider putting a small of salsa for dipping on the tray. You could even arrange your carrot slices and broccoli pieces to look like a carrot laying on a tray. Garden salad - Add a variety of different leaves such as iceberg lettuce and spinach. Cut onions, cucumbers, tomatoes, and celery into the salad. Also include a three different healthy salad dressings for guests to choose amongst. Whole wheat bread - Instead of higher-calorie white breads, consider serving whole wheat bread with just a bit of butter. 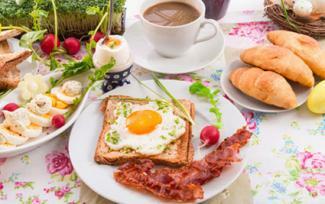 Lean turkey bacon or sausage - If you want to add meat to your brunch, consider using lean turkey bacon or sausage. Another option is to include a vegetarian version, such as MorningStar Farms sausage or bacon, which is perfect for those trying to diet and vegetarian guests. Egg white omelettes - Just because you are trying to save some calories, doesn't mean you have to forego egg dishes. Use the whites of the eggs and start with a plain omelet recipe, then pack the recipe with fresh veggies such as spinach, leeks, and carrots. Gluten-free pancakes - Don't skip the pancakes when planning a heathier menu. Choose a gluten-free recipe and top it off with sugar-free syrup and low-fat whipped cream with berries. Lemon mousse and strawberries - Lemon mousse is a good, low calorie treat that most guests will enjoy. It's light, refreshing and best of all, low in calories. Fruit sherbets - Fruit sherbets are refreshing and light, which is the perfect way to conclude a meal. Try a watermelon or strawberry sherbet. Serve a light drink to help wash down your healthy meal. Sugar-free orange juice and sparkling water are excellent choices. A special occasion like Easter is the perfect time to create an elegant affair for friends and family. Use your finest linens, nice dishes, and sterling silver silverware, along with fresh flowers on your table. 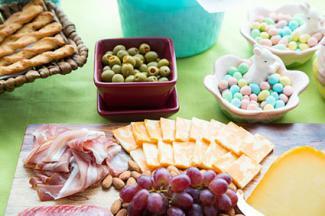 Assorted cheese platters - Create an elegant tray of a variety of cheese, sliced meats, and crackers. Olives make a great salty addition, too. Include dried or fresh fruits if you skip the fresh fruit mix. Kale salad - Baby kale is a nice sophisticated base for a salad. Add pickled beets, pieces of bacon, and a balsamic vinaigrette dressing. Consider adding dried cranberries and almond slices to your salad. Fresh fruit dippers - Mix a variety of fruits together to create a colorful bowl for your buffet. Kiwi slices, pineapple cubes, strawberry slices, melon balls, and grapes are good choices. Add a small bowl of marshmallow fluff fruit dip. Smoked salmon eggs Benedict - Classic eggs Benedict would be a fine addition to a brunch, but adding smoked salmon and a little herb hollandaise sauce can make the dish unforgettable. Lemon blueberry pancakes with compote - Spruce up traditional pancakes by adding lemon juice and some blueberries into the mix. Add berry and apple compote and whipped cream to the top of the pancakes. Roasted baby potatoes with thyme - Roasted baby potatoes are the perfect side-dish and are a crowd favorite. Try a herb roasted potato recipe with your brunch. Pastries - Provide guests with a variety of pastries like authentic cannoli or rose and key lime gourmet muffins. Cheesecake - Make your tastiest cheesecake and drizzle chocolate on top and garnish with raspberries for an elegant look. Coconut layer cake - A lovely coconut layer cake is a beautiful addition to any brunch. Cover the entire cake with coconut flakes and use small chocolate eggs to garnish. Offer guests a choice of the traditional breakfast drink, orange juice, and some more elegant offerings, such as sparkling cider or champagne. A big family gathering doesn't have to be expensive. Buy food on sale and use coupons to help save money. Use the budget friendly menu to help save you money yet provide a delicious meal for your family. Trim the number of dishes down a little to keep things affordable while still offering a nice selection of foods. Green salad - Cut a head of iceberg lettuce up to create a garden salad. Add in some onions, shredded carrots and other vegetables. Offer guests a garlic sour cream salad dressing that is cheap but flavorful. Mixed vegetables in cheese sauce - Serve a variety of frozen or canned vegetables with simple dressings. Frozen and canned vegetables are a lot more economical than fresh veggies. Carrots, green beans, and mixed vegetables are usually popular and can be served with an herb cream cheese sauce that makes it look like a gourmet side. Deviled eggs - Eggs are an economic and filling food, and when colored, are economical when they double as an Easter activity. Make up some deviled eggs with your leftover eggs from the hunt. Baked potatoes - Potatoes are cheap to buy in bulk. Make baked potatoes in the oven and provide butter, salt and pepper, sour cream, and shredded cheddar cheese for condiments. Quiche - A nice quiche can be an inexpensive main dish. Eggs are affordable and you can fill the quiche with a variety of inexpensive vegetables like broccoli. 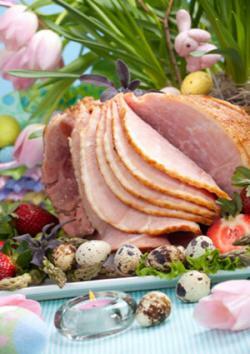 Ham - Ham is a traditional Easter food, so it is often on sale around that time of year and can be an inexpensive option for those who want to have a nice brunch on a budget. Add a quick ham glaze made from ingredients you probably have on hand and it will take your main dish up a notch. Water with lemon slices - Offer guests water with lemon slices as a drink option Some people prefer to drink water with their meals. At the very least, it will help to fill people up and encourage them to eat less and water is a free beverage, which stretches your budget. Donuts - Donuts are a quintessential breakfast item and they are a sugary sweet, cheap addition to your brunch. Make mini donut holes to help them go further. It is important that some people have allergies and you have to be mindful of this when planning your menu. Gluten and peanut allergies are not only common, but also be deadly. Educate yourself on your guests' diet restrictions, and read through ingredient lists before preparing the menu. Include a few vegetarian or vegan options, like vegan eggs Benedict, so there's something for everyone.